Kirsty Wertz (nee Reid): Unseasonably warm... long gone. Last week the weather here seemed like it was never going to get cold again. The sun was out, the chill had gone, and there was a feeling of Spring in the air. So much so that the boys spent a bunch of time outside playing wihtout any jackets. 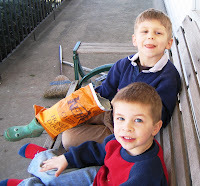 Here's a pic of them on the porch swing munching on a snack. Unfortunately, the weather reverted back to Winter and it's cold and rainy again!